Save Money - Repair What's Necessary. Find Out What Can Be Repaired. Call Us For Your Rain Gutter Repair Inquiries. Rain Gutter damage from standing water, clogging, severe weather, and falling branches is one of the most common issues that a homeowner faces. At Rain Gutter Pros Inc., we recognize that not everyone needs to be sold an entirely new gutter installation, and are happy to offer repairs that address only what’s needed to get your gutter system functioning well again. We believe the best way forward for our company is to build a trusting relationship with every customer by providing the best value for the money. 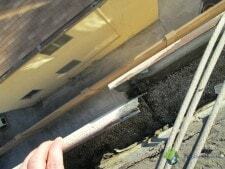 Give us a call and we’re happy to let you know what we can do to get your gutters back functioning like they should!